Soft stretchy cotton vests made to allow access to mickey buttons or g-tubes, stopping the embarrassment of having to undress your child to get them fed when you are out and about. The front opening will also allow you to change your child’s nappy when you need to- as well as keeping your child warm and comfortable all day and through the night. 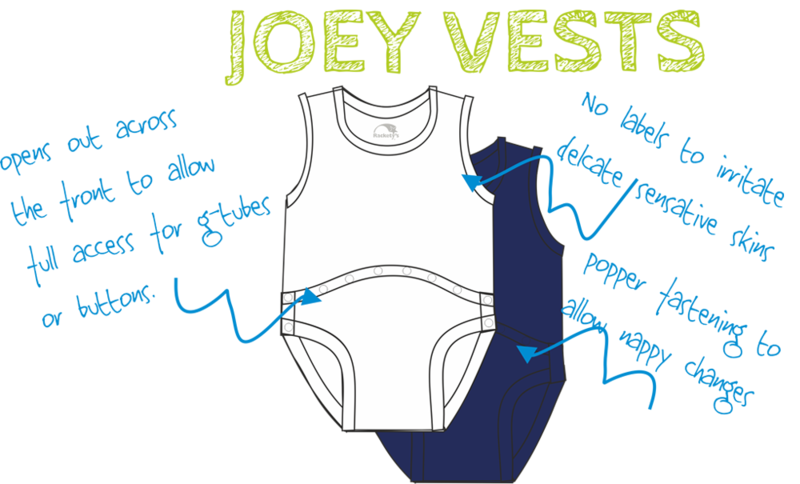 Called a Joey vest because it looks like a kangaroo pouch and the idea was suggested by Joe’s Mum ! ♥ 94% soft cotton interlock knit fabric 6% elastane. ♥ poppers to allow tube access and nappy changing.